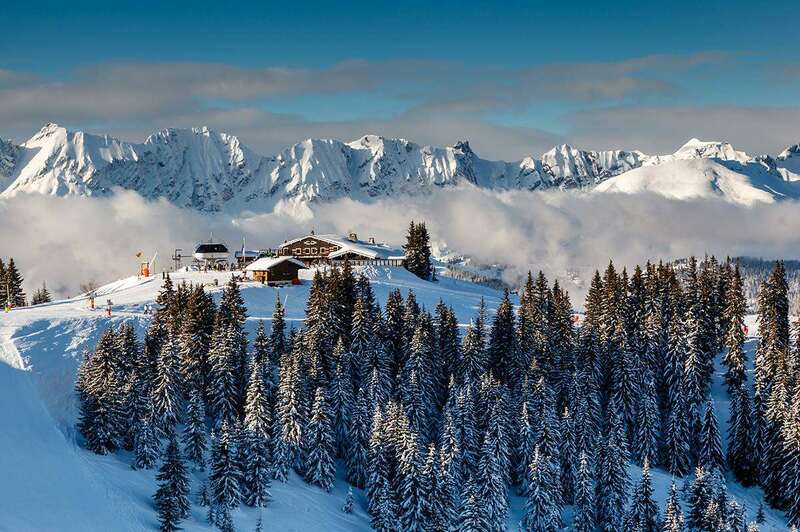 As an old town with a richly medieval feel, Megeve is an ideal ski destination for skiers looking for a cosy resort with a wonderful atmosphere and outstanding scenery. After being a highly successful holiday location in the 60s, the village is enjoying a renaissance, with visitors appreciating its laid-back feel and fantastic slopes. The Evasion Mont Blanc domain is made up of 5 villages including Megeve, Saint Gervais, Saint Nicolas, Les Contamines and Comboloux. There are more than 220 slopes to explore between 8 summits. Megeve is one of the largest ski towns in France, meaning there are plenty of excellent attractions based close to the slopes, including a casino, concerts, conferences and ice shows. With the breathtaking Chamonix ski area on your doorstep; this friendly resort is the perfect base to enjoy some of the best runs in the whole of Europe. The ski season in Megeve operates from December to April and the runs are immaculately maintained to ensure an excellent surface. With plenty of extraordinary runs to choose from, Megeve is a fantastic resort for skiers of all abilities. 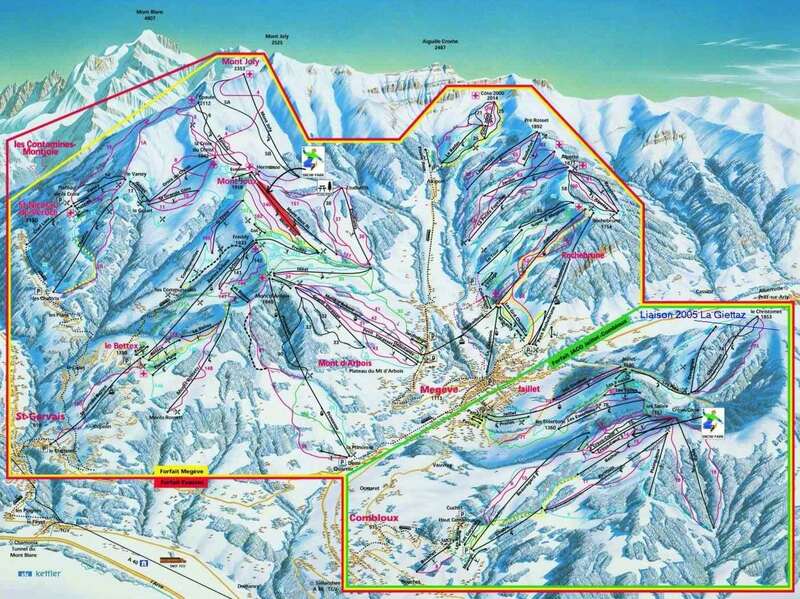 The skiing is divided into 3 areas, Mont d’Arbois, Rochbrune and Le Jaillet all of which provide flattering skiing for intermediates and beginners. If you are a newcomer to the sport, the top of Mont D’Arbois and Le Jallet offer some great nursery slopes. Families will love the gentle slopes and wide open runs. For more experienced visitors, Mont D’Arbois could be one of the top options, with plenty of terrain designed to offer a great learning curve and help visitors develop their abilities without risking their safety. When it comes to advanced skiers, there are some tricky routes to take on, including the Voltigeurs run and the tough routes from Mont Joly, the area’s highest point. Megeve benefits from a wide variety of restaurants, with 89 different eateries to choose from across the resort, including 3 Michelin Starred restaurants! There are 45 local farms that supply fantastic produce to the surrounding restaurants. Auberge Bonneval is one of the top mountain restaurants, whereas traditionally cooked Savoy specialities are only a short walk away at the Bistro Savoyard in town. If it is snacks that you are looking for, there are several outlets across the village, including Le Refuge du Boulanger, where a variety of cakes, jams and chocolates are available. Before or after you’ve had your fill of food, you can explore some of the awesome attractions available across the resort. Whether you want to try the resort’s casino, or keep up your active lifestyle with ballooning, climbing or ice hockey, there are plenty of options. The closest airport to Megeve is Geneva, which is around an hour away. Megeve is massive. The short transfer is a big bonus from Geneva. Nothing's going to trip you up here, the skiing is easy peasy and lots of it. If you have a (fake) fur coat them now's the time to get it out. If you have a little dog bring that too. If you like your food then come prepared to eat. It's not the place for late season skiing and is the place to warm up your legs up if you're on the way to Chamonix. It's not cheap here, make sure you have a cool outfit on the slopes before you leave home... if you buy one out there you're going home skint! Perfect place for families to go skiing, there are no cliffs to fall off.